Home Applications VoteItNow! - What do you think? VoteItNow! - What do you think? 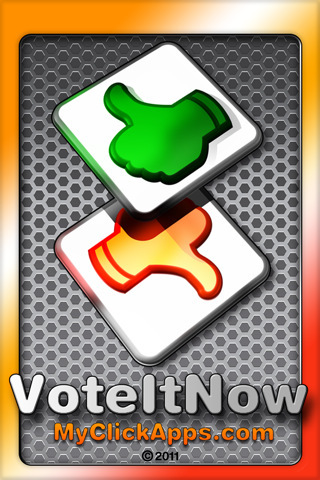 LLC Myclickapps.com has developed one more creative app- VoteItNow! The app allows you to search products and discover which friends like them which don’t as well as request their opinions about them. VoteItNow! makes it easier for you to decide what products to buy. Moreover, VoteItNow! allows you to express your opinion about products that you like or dislike. It is a unique social recommendation tool that you wish it exists long time ago. VoteItNow! makes decision about buying products a breeze. If you’re undecided about which products to buy and would like to ask your friends about their opinions regarding specific products you are thinking of buying, VoteItNow! Is there for you to help! • Express your opinion about products you like/hate. • Share your comment on Facebook. • See which friends like/hate certain product. • See similar popular products related to the one you are searching. The special things about the app are that it allows you to ask your friends’ opinion about certain products and even posts the opinions on your Facebook wall. The new update, released recently, allows you to share on Twitter and bar code scanning is also possible. The app is free and can be downloaded right from the App Store by clicking here.